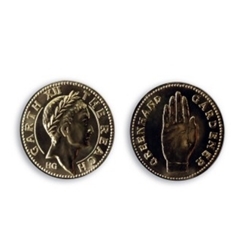 The design of this coin is based upon a facet of Game of Thrones in which we find that a gold coin featuring the hand sigil of House Gardener is still in circulation some three hundred years after the Gardeners have become extinct. It is about the same size as a dragon, but valued at 1/2 dragon because it is thinner and lighter. We find that, as we enter the tale, the matriarch Olenna keeps a chest of hands in her carriage, using them in place of dragons to pay rude or insulting toll-takers on the road, in order to dupe them into taking only half their request. The coin features King Garth Gardener the 12th, King in The Reach, wearing a crown of laurel leaves. The letters HG below his bust signify the mint at Highgarden. The reverse side features the hand sigil of House Gardener, and the name “GREENHAND” to honor the scion of the line; Garth Greenhand. The Gardeners were a powerful clan in the early days, but during Aegon’s conquest the last king of the line, King Mern the Ninth, was killed in battle and Highgarden became the seat of House Tyrell. Struck in cartridge brass, this coin weighs about 5.6 grams.